"Myths of Modernism: Japanese Architecture, Interior Design and the West c. 1920–1940" - McNeil, Peter (1992). In 1925-26, seven issues were devoted to the up until then life work of Frank Lloyd Wright. The cover designed by him, used bold red and black graphics. This cover, one of several created by Wright, is one of the first European publications to promote and document the work of an American designer. It has special title: “The life-work of the American architect Frank Lloyd Wright,” colored cover by Frank Lloyd Wright. This richly illustrated collection of Wright’s early architecture includes essays on his work by architects of the period and by Wright himself. Features more than 200 photographs, plans and drawings of his early residential and commercial designs. Frank Lloyd Wright 1925 Wendingen Series – Can be found at the Rijksacedemie in Amsterdam. If you have enough time and love books and have a special interest in this series become a member for one year with a small fee, it’s worth it. Through the many drawings and photographs in this series I could see so many types of architectural styles from Mayan to Indian temples and Japanese style. It is what attracted me to the picture you can see in this post. I could see many similarities in Japanese architectural elements that appear in the pictures and drawings repeatedly. I have a great interest in Japanese culture and architectural elements also play their role in that. The nice thing about these buildings is that they are build outside Japan in United States, and with materials used of course different and available in that time. I chose the drawing of one house specially designed for the 21st governor of Wichita Kansas, Henry J. Allen. 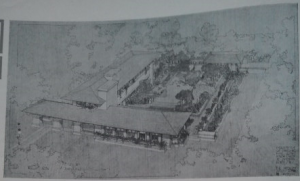 Who hired Wright to design his home in Wichita, Kansas. Allen’s home is the only residence designed by Wright in Kansas. Like many Japanese homes the garden has a special place and for the big part the home surrounds it. I can see Wright was influenced by the functionality of this style which surely must have influenced his later modernity. He of course visited Japan and not only was he influenced but the reverse also occurred.